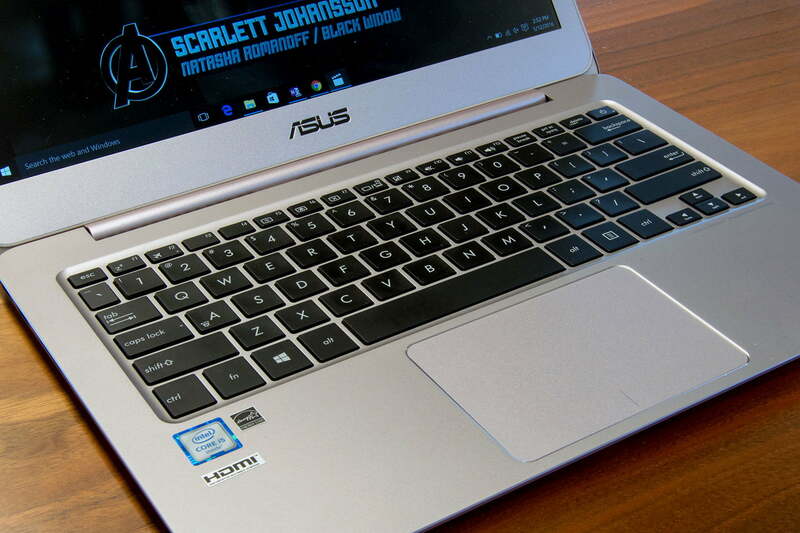 Asus’ near-perfect Zenbook UX305UA is easily the best ultrabook value yet. Update 6/19/2017 – The Asus Zenbook UX305UA is going out of production and will no longer be available, but the Zenbook UX330UA is a worthy successor and has our full recommendation. 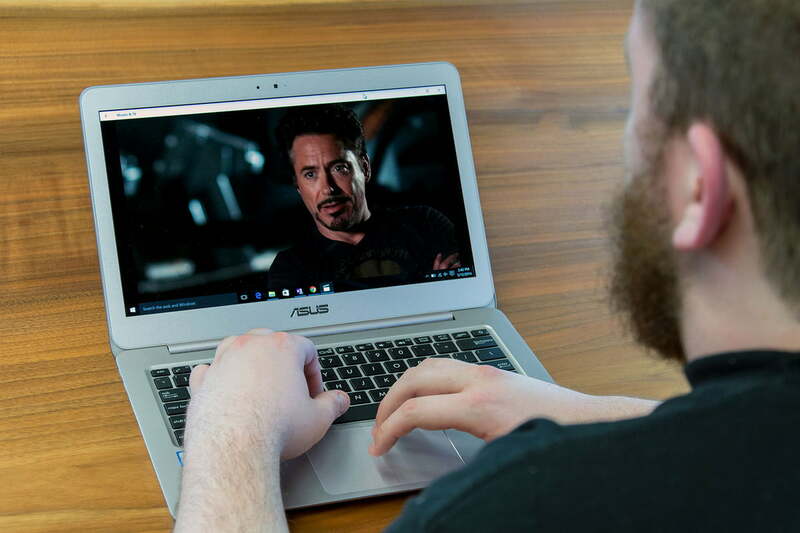 Asus’ Zenbook series has been on a roll as of late, led by the Zenbook UX305CA, an excellent, affordable ultrabook that won our Editor’s Choice award. Our one small complaint was with its performance, as the UX305CA has a Core M processor – less powerful than a standard Core i3, i5, i7. So we were excited when Asus announced its new UX305UA with a Core i5-6200U. The same notebook with a more powerful CPU. What could be better? As it turns out, though, the UX305CA and the UX305UA are not direct relatives, as their names suggest. The UX305UA is in fact a different system, thicker and heavier than the UX305CA. It not only has a faster Core i5 processor but also a different hard drive, a bigger battery, and an active cooling fan. These changes have also bumped the MSRP up by $50, from $700 to $750. While these changes may seem subtle, they’re important. The UX305CA is an affordable, super-portable system that excuses its lackluster speed with extreme light-weight design and great battery life. 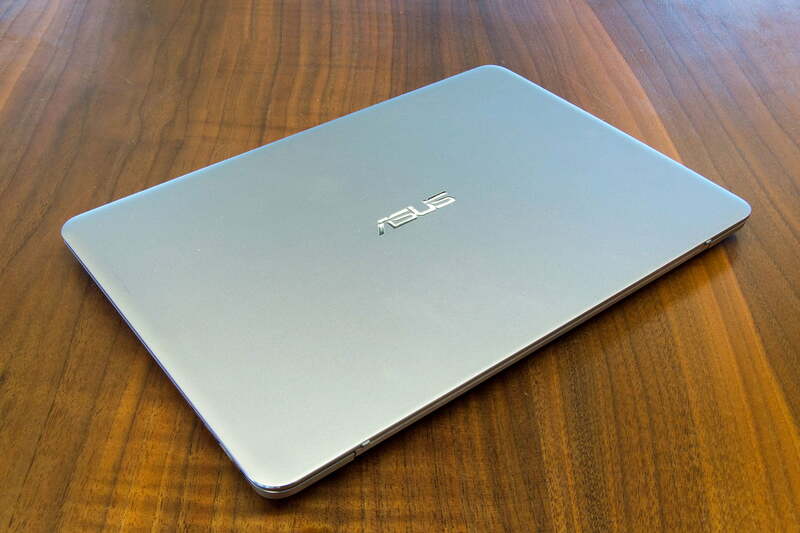 Asus’ UX305UA, on the other hand, is a direct competitor to Dell’s excellent XPS 13. 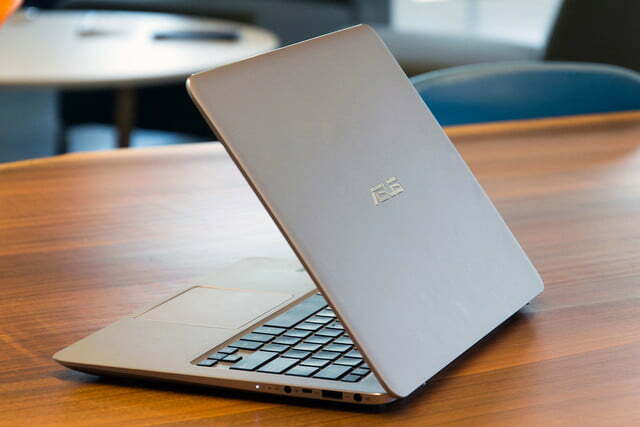 Does this new Zenbook continue Asus’ winning streak? At a glance, the Zenbook UX305UA looks a lot like its thinner cousin. It has the same overall, simple design language, with predominate use of metal bound together by some plastics components, such as the display hinge and bezels. 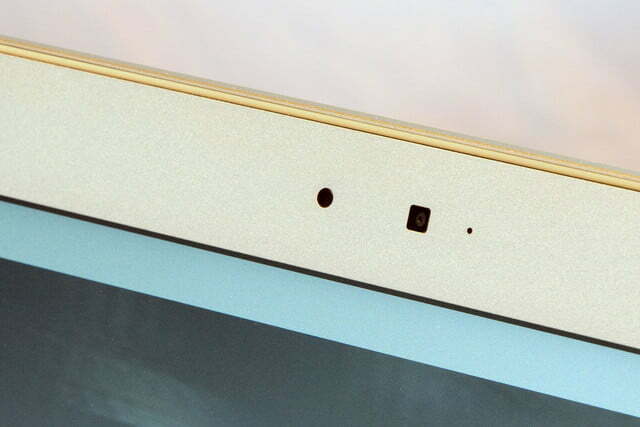 Speaking of the bezels, they’re again on the thick side, which gives the Zenbook an old-school look. On close inspection, the differences between the older UX305CA and the new UX305UA are obvious. The latter system is just over a tenth of an inch thicker and, importantly, is not as aggressively tapered, which means it feels thicker than the on-paper gap suggests. Weight has increased, too, with the new UX305UA ballooning up to 3.2 pounds. That’s about a half-pound more than a Dell XPS 13 (without touchscreen) and about eight-tenths of a pound heavier than the UX305CA. Despite its weight gain, the Zenbook UX305UA retains a simple beauty. Still, despite its recent weight gain, the Zenbook retains its usual strengths and weaknesses. Its matte silver metal exterior is elegant, though not eye-catching, and holds up well to use. The chassis feels durable, without a hint of flex in any body panel. Some will find the design too generic, while others will enjoy its simplicity. Personally, we tend towards the former, though there’s no denying Dell’s XPS 13 makes the UX305UA – and most ultrabooks, for that matter – look out of date. While we loved the laptop’s look and general build quality, we did notice a slight bend in the chassis. It wasn’t visible, but apparent because the system always sat ever-so-slightly off level when placed on a table. This is a common potential defect (any metal chassis will bend), and would normally make a notebook eligible for return. We are not holding this against the system’s score, but felt the flaw should be noted. 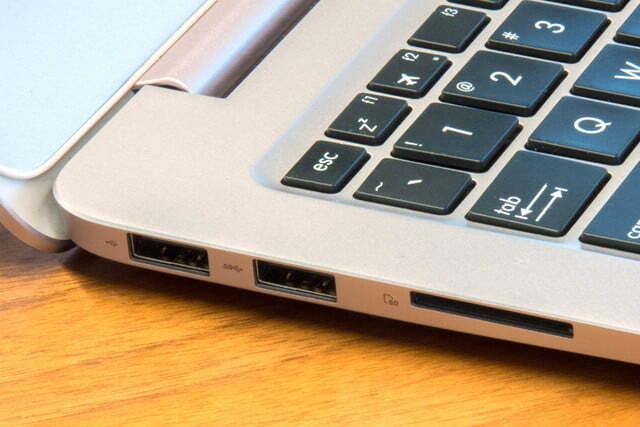 The design of the UX305UA is derivative of its thinner cousin, but the keyboard and touchpad are a rip-off. It’s impossible to say they’re the same without ripping both systems apart, but they look and feel identical. Thankfully, that’s a compliment. The keyboard is excellent for a 13-inch ultrabook, with a spacious layout, full-sized keys, and no oddities to trip up our muscle memory. Key travel is excellent and keys bottom out with a responsive, satisfying action, which makes touch typing a cinch. Like its cousin, the UX305UA does not have a keyboard backlight. That’s a more significant flaw here than it was with the thinner Zenbook, as the UX305UA is more expensive and competes directly with mid-range ultrabooks, almost all of which have backlit keyboard. You may forget that problem, though, once you start using the touchpad. It’s spacious, responsiveness, and easily handles Windows 10 multi-touch gestures. It doesn’t feel as smooth as a MacBook, but it’s close, and it’s certainly better than average among systems in its price range. 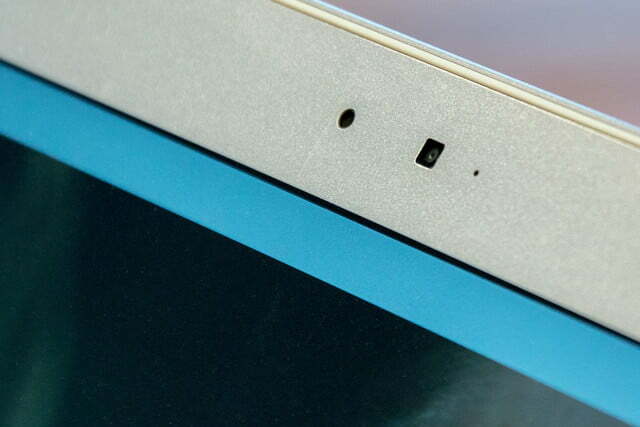 It may even beat the XPS 13, which has excellent touchpad feel, but a smaller touchpad surface. The display is another component the UX305UA seems to share with the thinner UX305CA. 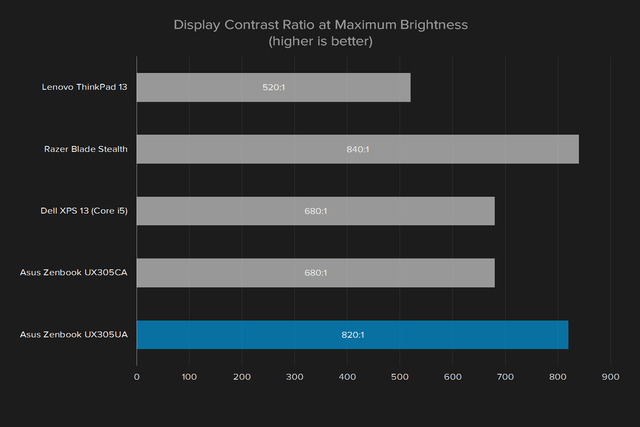 It’s once again a 1080p non-gloss panel without touch functionality, and once again achieves average scores in our benchmarks. 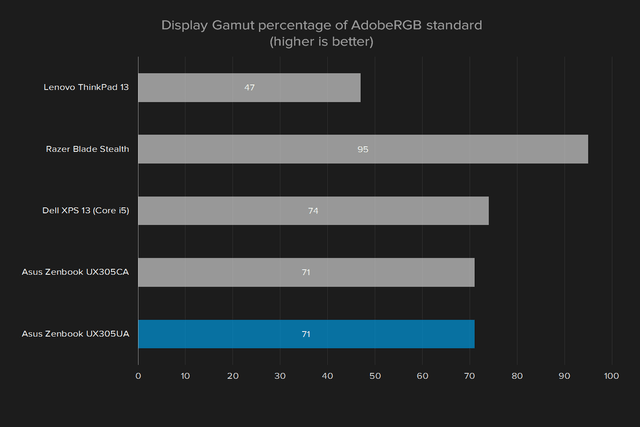 We found the screen can product 95 percent of the sRGB color gamut, and 71 percent of the AdobRGB gamut. These numbers are middling. They easily beat alternatives like the LG Gram 14, but come in a bit behind Dell’s XPS 13, which hit 97 percent of sRGB and 73 percent of AdobeRGB. Contrast fares better. We measured a maximum ratio of 820:1 at maximum brightness. That beats the Dell XPS 13’s ratio of 680:1, and nearly matches the more expensive Razer Blade Stealth, which produced a ratio of 840:1. Other areas fall behind, however. Gamma is the best example. We measured a curve of 2.4, which is off the ideal of 2.2. In practice, this reading means the UX305UA’s display looks noticeably darker than it should. Images sometimes lack shadow detail, and the images that should appear vibrant look colder and less inviting than they should. 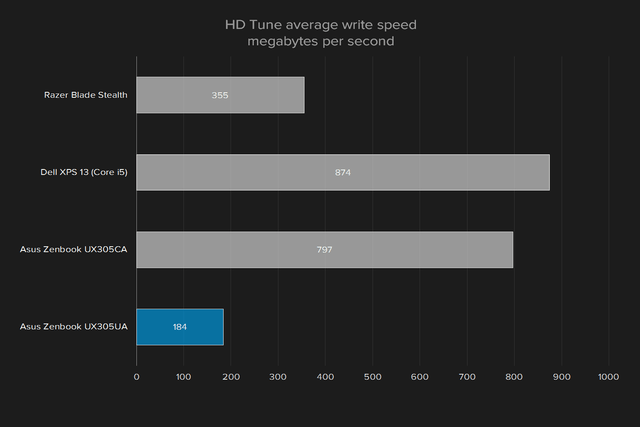 On balance, though, the UX305UA does well compared to other mid-range ultrabooks. Your jaw will remain firmly in place, but the scenes display with respectable color accuracy, and excellent sharpness. The use of a non-gloss display helps tremendously in bright rooms, too. Nothing short of full sunlight will reduce the screen’s readability. A pair of speakers are hidden underneath the Zenbook UX305UA, which means sound is easily muffled by the surface it’s placed on. When they’re unobstructed the speakers sound strong, and even produce a slight hint of bass. The positioning makes them unreliable; depending on the situation, they can sound strong and clear, or weak and muddy. As mentioned, the Zenbook UX305UA comes with an Intel Core i5-6200U processor. This is arguably the most mainstream of the current mobile dual-core chips from Intel, and we’ve seen it in numerous systems already. Still, it’s interesting to see how this model compares to the Zenbook UX305CA, which is just $50 less expensive, and has an Intel Core M3-6Y30 processor. 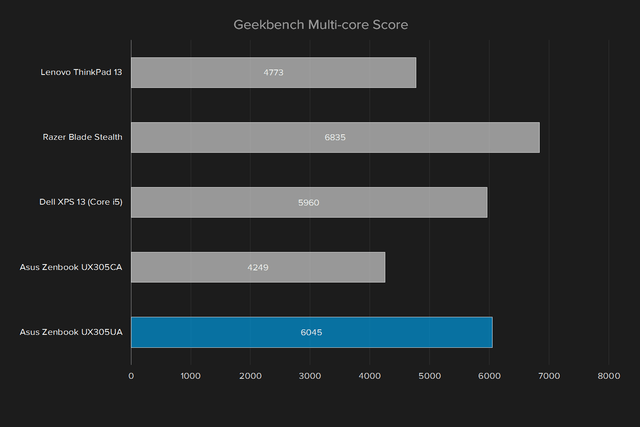 The Zenbook UX305UA’s Geekbench multi-core score of 6,045 is a tad bit higher than the Dell XPS 13 with Core i5 processor, which scored 5,960. 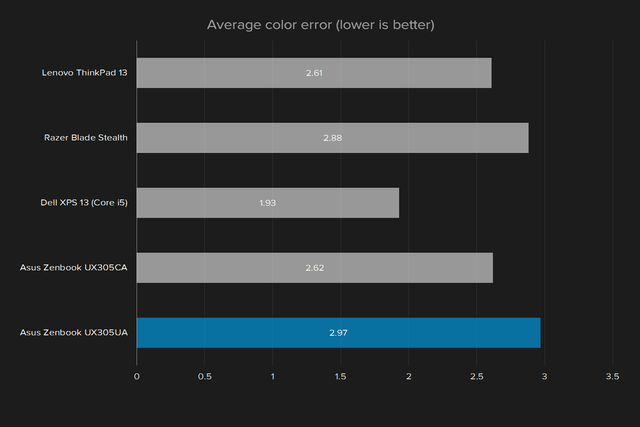 And the new model easily exceeds the thinner UX305CA, which only scored 4,249. 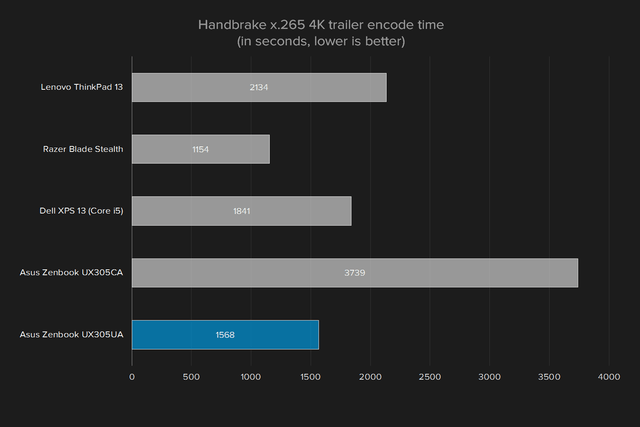 The 7-Zip benchmark and Handbrake showed even larger victories. In Handbrake, the UX305CA needed over an hour to encode our test clip, a 4K trailer of Elysium that runs four minutes, 20 seconds. The new UX305UA model did the same in under half an hour. That’s a huge difference. Neither Zenbook is ideal of serious number-crunching, but it’s obvious the Core i5 is superior to Core M when significant processing power is needed. If you edit photos and videos, for example, the UX305UA’s processor will save you a lot of time. Our review unit arrived with a 256GB solid state drive from Micron, connected over the SATA3 interface. SATA drive performance is often limited by the interface’s capability, and the UX305UA is no different. As you can see, the UX305UA and UX305CA perform almost identically, which makes sense. There’s no reason these two models should have different hard drives. 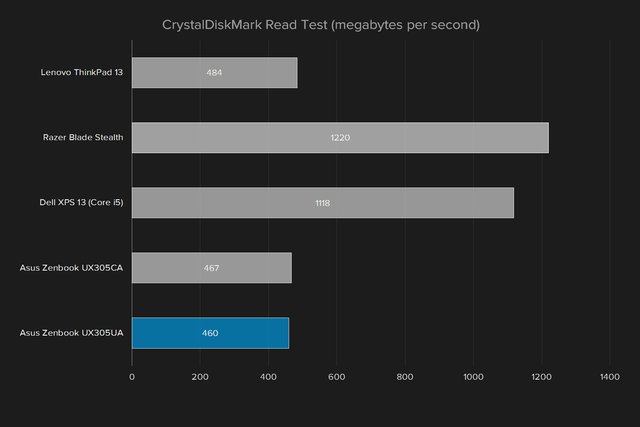 Both Zenbooks come in behind the quickest competitors in Read speeds, but they fare well in write performance. We did note, though, that in HD Tune – a sustained transfer test – the Zenbook started to slip up. 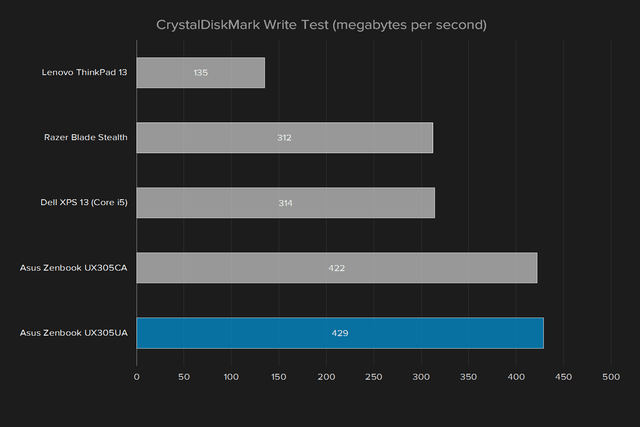 The Micron solid state drive is certainly snappy enough for day-to-day use. It isn’t the best choice if file transfer speed is trait you care about, but most users will find it adequate. 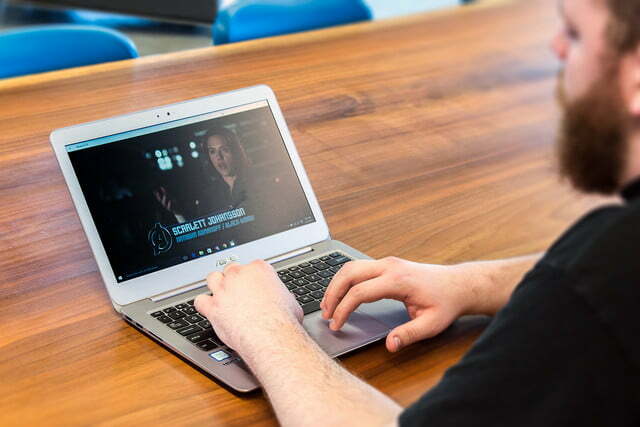 The Intel Core i5-6200U equipped by the Zenbook UX305CA comes with Intel HD Graphics 520. This is the most common of the current Intel HD incarnations, but quite far from the most powerful. Still, can it handle basic games? 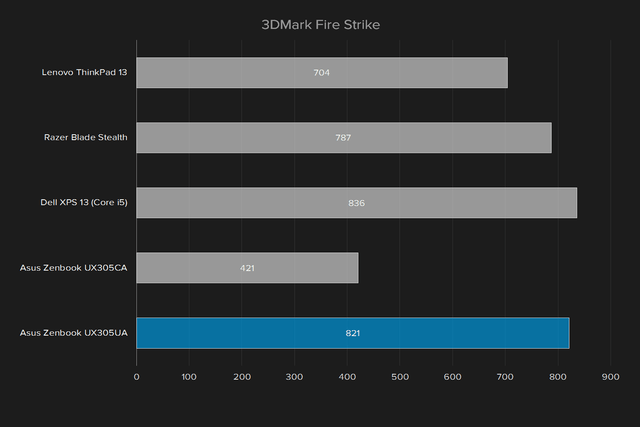 The 3DMark Fire Strike score of 821 more than doubles the thinner UX305CA, which once again shows this new, thicker model has its perks. 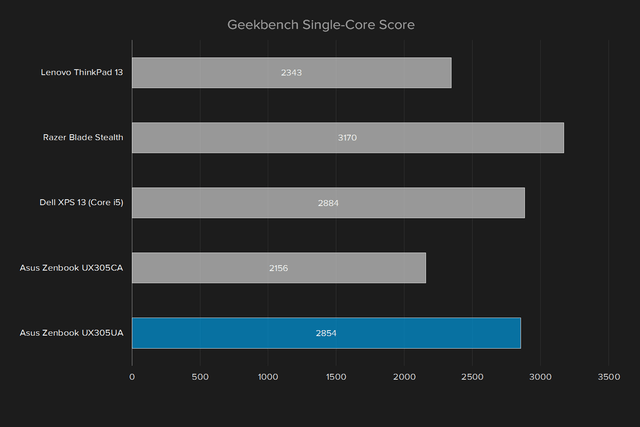 However, the score essentially ties other Core i5-6200U notebooks. 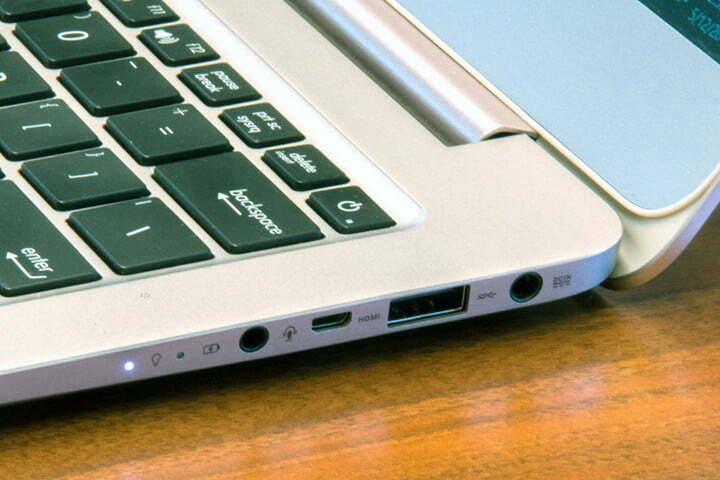 You’ll find no advantage over other ultrabooks here. We also fired up Counter-Strike: GO and Heroes of the Storm at 1080p resolution. Both games were playable if detail was set to low. Counter-Strike was even smooth, as it averaged a decent 73 frames per second. Heroes of the Storm averaged a choppier 45 FPS, and the most intense bursts of actions dropped the framerate below 30 FPS. Both games dipped below 20 FPS when detail was kicked up to maximum. Plumping up this Zenbook isn’t just needed to stuff in quicker hardware. Asus has also crammed in a bigger battery. While the thin Zenbook UX305CA has a 45 watt-hour unit, the UX305UA has a 54 watt-hour battery. This is very close to the Dell XPS 13, which has a 56 watt-hour battery. The question, of course, is if that will offset the new Core i5 processor’s higher power draw. And the answer? Not quite. Our Peacekeeper web browsing benchmark loop sucked the battery dry in about five and a half hours, while the the UX305CA lasted almost six hours. Still, we think the trade-off between performance and portability is a good compromise. As shown earlier, the new model is substantially quicker than its thinner cousin. 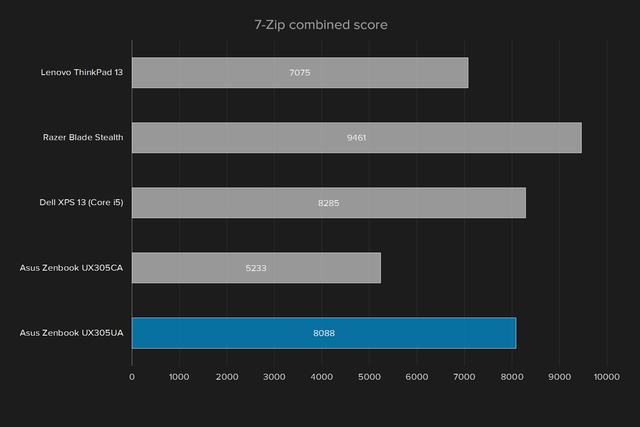 The Zenbook also compares well against its rivals. While the Dell XPS 13 lasted much longer, the Razer Blade Stealth and Lenovo ThinkPad 13 – both with smaller batteries – can’t touch the UX305UA. 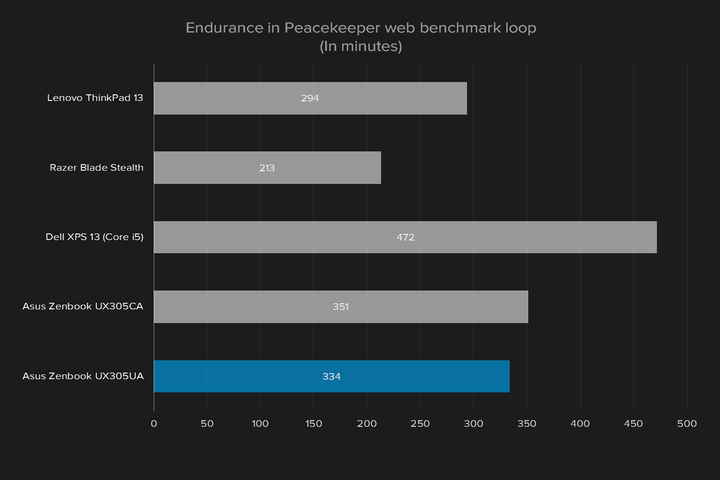 And buyers should note that our Peacekeeper loop is demanding. Our more mundane web browsing test, which is not as strenuous, extended the UX305UA’s battery life to almost nine hours. A full charge should last most users an entire workday. One fundamental difference between the Zenbook UX305UA and the UX305CA is how each is cooled. Placing a full-fledged Core i5 into this model means an active fan is needed, while the UX305CA’s use of a Core M processor makes passive cooling possible. As a result, the latter system is always silent. The display offers respectable color accuracy, and excellent sharpness. The UX305UA’s fan is noticeable, but it’s rather tame. At idle the fan is difficult to pick up above ambient noise, and at full load it produces just 43.7 decibels. That’s on par with the Dell XPS 13. We’ve tested systems that are louder, like the Lenovo ThinkPad X1 Yoga, and those that are quieter, like the LG gram 14. But most with a fan land somewhere between 40 and 45 decibels. Heat isn’t an issue. We measured a maximum external temperature of 100 degrees Fahrenheit at full system load. At idle, the UX305UA averaged 85 degrees. These numbers are again on par with the Dell XPS 13. The fanless UX305CA, with its less powerful processor, hits a similar maximum – though we found it rose to its maximum of 100 degrees a bit more quickly. 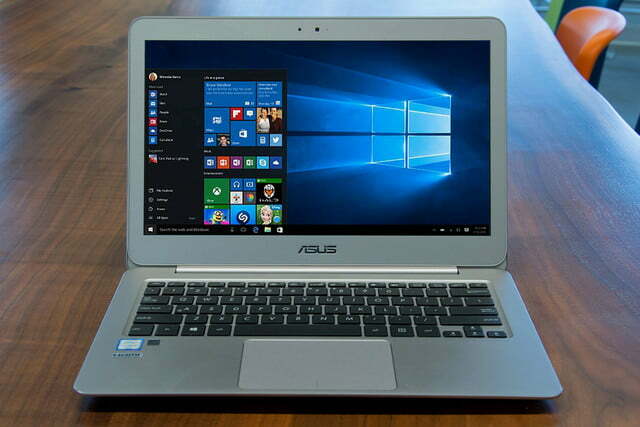 Asus ships the Zenbook UX305UA with the typical one-year warranty against manufacturer defects. That’s standard for any laptop, no matter its price. Asus’ Zenbook UX305UA is an initially confusing ultrabook. It looks similar to the UX305CA at a glance, and it appears to share some components, such as the keyboard, touchpad, and hard drive. Even the price has barely changed, rising to $750 – a mere $50 more than the UX305CA. It might seem that Asus has decided to compete with itself. Yet on close examination, it’s clear the UX305UA is a different animal. We love the Zenbook UX305CA, but there’s no denying its lackluster performance is a handicap. 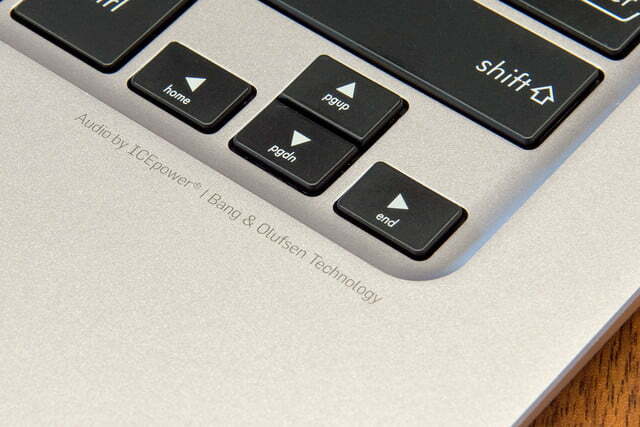 The UX305UA removes that handicap, making it more directly comparable to the Dell XPS 13 and other flagship ultrabooks. The result is a great laptop, and a great value. 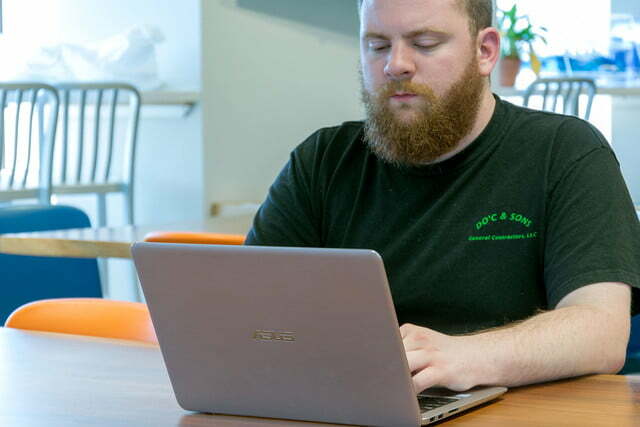 Competitors that sell for $750 often make do with a Core i3 processor, rather than the UX305UA’s Core i5, and have performance that suffers for it. Many also have just 4GB of RAM or a 128GB hard drive, while the UX305UA has 8GB of RAM, and a 256GB hard drive. Even the display is solid. Put simply, the Zenbook UX305UA good to great in every area, with no serious weaknesses and an incredible price. 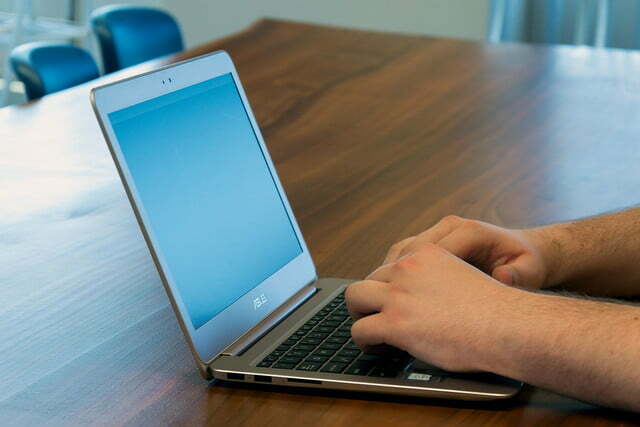 This is the ultrabook to buy if you have about $750 to spend. Period.